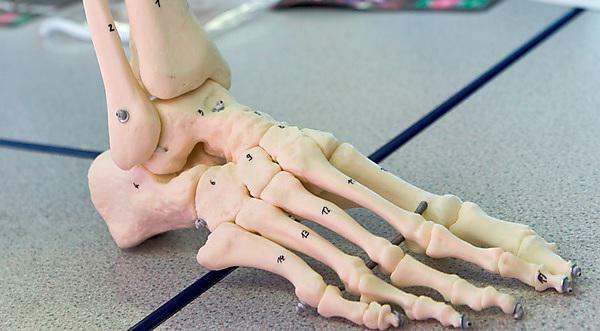 A podiatry academic from the University of Plymouth has been awarded a sought-after Clinical Trials Fellowship from the National Institute for Health Research (NIHR). Dr Joanne Paton, Podiatrist in the School of Health Professions, was one of only six academics nationally to receive the fellowship, after submitting a successful joint application with Peninsula Clinical Trials Unit (PenCTU) in Plymouth. The fellowships are designed to support existing NIHR Trainees with an interest in, and experience of, working with clinical trials. Dr Paton is currently an NIHR Clinical Academic Research Fellow and leads the Balance Enhancement, Ulcer Prevention (BEUP) research group at the University; the work of which is focused on improving the foot health outcomes of people with diabetes and neuropathy. The group has particular expertise in the development and evaluation of insoles for people with diabetes at increased risk of developing a foot ulceration or experiencing a fall. Her next step will see her based at PenCTU working across several trials, including those involving complex interventions, in order to experience all aspects of the trials’ design and delivery. Find out more about the BEUP research group. Our long-term aim is to translate the results from our published research to influence and inform everyday clinical practice to focus on the problems faced by people with diabetes and neuropathy. The group involves researchers, podiatrists, physiotherapists and people with diabetes. Together we apply specialist knowledge of diabetic foot ulcer management, foot pressure analysis, orthotic design, balance problems and walking disorders. The team has secured grants in excess of £1 million pounds in collaboration with industry, other universities, and the NHS. Current studies in the portfolio include an automated 3D-printed insole, a novel balance enhancement insole, research examining balance control in people with diabetes and a clinical trial testing pressure data guided insoles. The PenCTU, accredited since 2008, and the only such National Institute of Health supported CTU in the South West, includes clinical, methodological and trial management expertise. Never underestimate the difference your care makes to people’s lives. I have examples of where limbs and lives have been saved by routine podiatry care, or where issuing an insole has kept people on their feet and living independently in their own home.